Mae is in her nineties, she's tiny and precious, tough as nails and loves bringing her weavings to us. In years past, she used to weave larger pieces, but the arthritis in her shoulders is too much now and she only weaves small pieces. She had a stroke a few years ago, but has come out of it just fine. She only went to the second grade because her parents pulled her out of school and took her home to take care of them. They told her "That's all there is of school." Mae grew up without any of the modern conveniences in a traditional Navajo home. She insisted that her children go to school and they all have good jobs. Mae lives on the same homestead where she was raised. She no longer herds her own sheep or takes part in the shearing, but does card her wool and dyes many of her yarns with vegetal dyes. She doesn't drive, so she saves her rugs until she has about 10 or 12 and then calls Rosita to drive her here to Durango. It is a special day that everyone anticipates when she comes to the gallery . Mae and Rosita, and sometimes other family members, bring her weavings in, wrapped in a cotton sheet and we lay them out in the rug room. Mae doesn't speak much English, so there is a lot of translating going on and it is hard to catch her smiling, except with her eyes! The pride she has in these beautiful rugs shows right to her core. She loves the photographs we have taken of her with the weavings over the years, but not one of them shows her smiling. She just gives you that knowing look that has once again created beauty. She gives you a big hug before heading back to Crownpoint, NM to start again. We are so lucky to have worked with Mae all these many years. 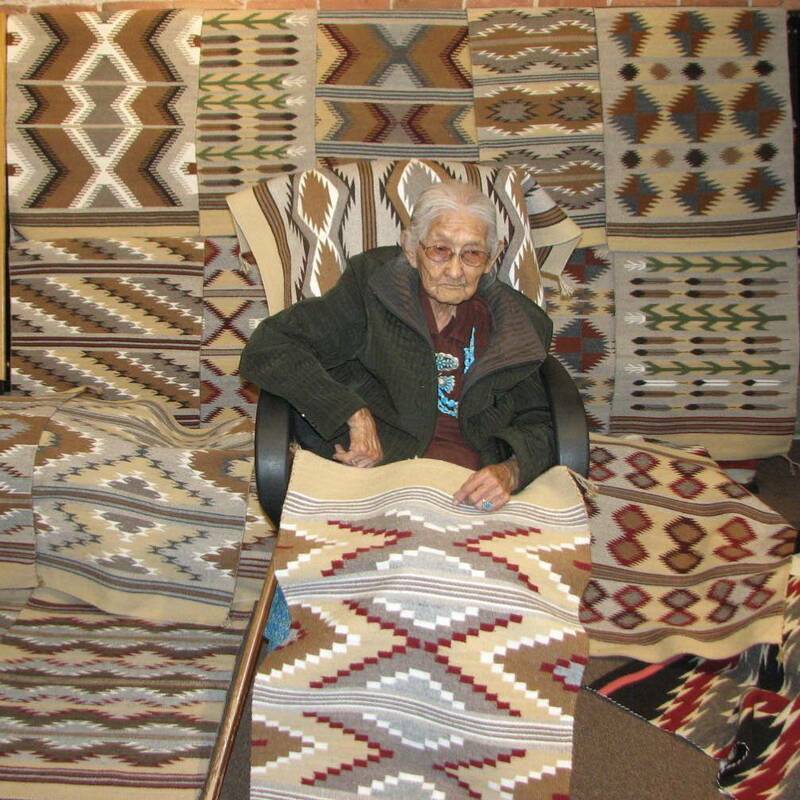 Her rugs today are very nice, small, affordable examples of a true American art form. Something that anyone would be proud to own.